Val Thorens, France: The good weather came back. The sun finally shone on the Val Thorens snowpark. And some of Europe?s most talented young freestylers got to show their moves on the last day of The North Face Ski Challenge Presented by Gore-Tex. ?As tough as yesterday?s conditions were,? said event founder JP Baralo. ?As disappointed as we were not to be able to crown overall winners in the Teens and Kings, today?s freestyle contest showed just how high the skiing level is here this week. These guys rocked the park!? Finish rider, Roope Leppänen was the big winner today, showing off stylish jumps, classy moves and serious amplitude. He was followed in the Kings division by his teammate Ville Koskala and Sweden?s Niklas Granlund. ?I?m so stoked to be competing here,? said Grandlund (who was also a strong performer in the freeride portion of the event). ?I had so much fun jumping in the park today. This whole event is so-o-o cool!? In the Teens, it was Swedish rider Jesper Tjäder who carried the day with a score of 29 points. But his win was never assured. For close behind ? less than a point away in the final compilation ? were Perttu Hyvärinen and Antii Ollila, both of Finland. ?It was a really close contest,? said judge and The North Face Team Manager Matteo Vettorel. ?These young riders certainly put it out there today. Very impressive. It?s really too bad we couldn?t have finished off the event yesterday?? Sunday?s storm was indeed frustrating for all concerned. While the judges were able to evaluate one slopestyle run in the park for the Queens and Kids -- and thus ensure an overall winner in these categories -- the inclement weather refused to let up in the afternoon and the older athletes were forced to sit on the sidelines and watch. ?It was so close,? explained Baralo about the decision to award separate freeride and freestyle titles to the Teens and Kings. ?But in the end, with some of the top overall contenders having to leave the resort to go back to school, we decided it wouldn?t be fair to carry over the contest to today.? Instead, top Freeride Teen, Jules Mandin of France was honoured for his scintillating run last Friday. His French teammates, Maxence Gisin and Quentin Glath -both locals from Val Thorens- were also recognized for their second and third place performances on the demanding Glacier de Thorens. ?I really had fun on my freeride run,? said Mandin. ?It was a great venue for this kind of event. It really encouraged us to show the judges what we can do?? 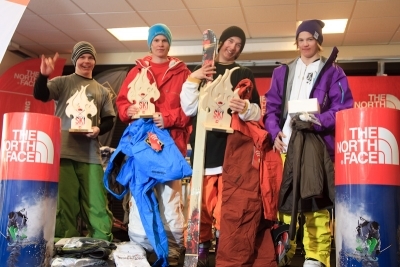 In the Kings, it was French rider Raphael Vouillamoz, who took top freeride honours. In second place was Swedish all-rounder Niklas Grandlund and third was taken by mop-haired Timothée Picq, also of France. ?This is truly a fun event to compete in,? said Picq. ?I feel like I learned a lot here this weekend.? As was already mentioned, the bad weather held off long enough on Sunday for the overall title to be at least decided in both the Kids? and Queens? categories. And while mountain conditions were far from at their best, the guys and gals who went out there and jumped showed just how motivated they really were. ?It was far from easy,? said the 13-year old Kids? winner, German rider Lucas Mangold. ?But I?m really happy about winning this event. I?m proud of being crowned the overall winner today.? Second place finisher in the Kids? overall was Sweden?s Toby Jenssen. In third was nine-year old skiing sensation, Pavol Kuric of Slovakia. ?Pavol was very disappointed with his skiing in the snowpark during the contest,? said his coach, Andrej Maslik. ?There were a lot of tears. But it was also the first time in his life that he completed a 900. That brought lots of smiles. So I think, overall, he is really happy. We learned a lot this week.? In the Queens? category, the only female division contested in The North Face Ski Challenge, the riders were tested to their very limits. A combination of poor visibility and big jumps created difficult moments for the young women. With a near-unbeatable lead in the freeride segment, France?s Samantha Bernos seemed to have the overall title in the bag. But nerves and bad decisions almost cost her the coveted title. ?I skied so-o-o bad in the park,? she moaned after the day was over. ?I don?t know what happened. It was just one of those things?? Still, she managed to hold off her rivals. But just. In second place was Ariana Tricomi of Italy, who had solid runs in both the freeride and freestyle segments. She was followed in third place by Bernos? Chamonix teammate, Jessica Muniesa. ?I wish I could have skied better this weekend,? said the 18-year old. ?But still, I?m very happy to have made it to the podium today.? As the riders prepared their bags and got ready to head home ? with smiles on their faces and new friends? names in their phone directories ? event founder Baralo reflected back on the last three years. ?It?s been quite a ride,? said the Val Thorens resident, ?but now, I think we?re really beginning to show what great athletes these kids are. This week had its challenging moments. But then, that?s what competing in real mountains is all about. Sometimes the weather cooperates. Sometimes it doesn?t. What I?m most excited about are the positive attitudes we encountered among the riders this week. No matter how tough it got ? no matter how much we asked of them ? they were always ready to go. It was a real pleasure to host them on the mountain this year. ?